'mouse-click' in animation & press right-left arrows to advance the image. 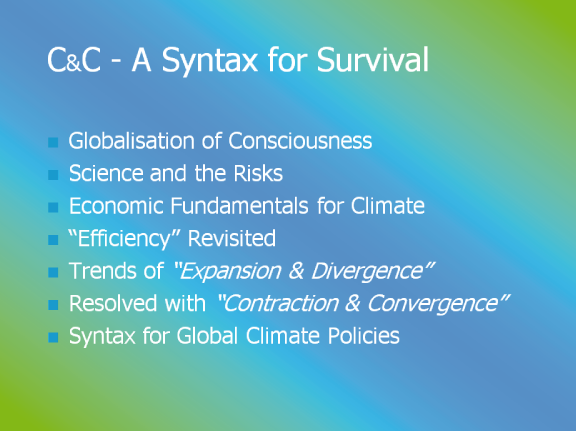 the 'bath' [like the global atmosphere], raises the level of the bath-water [like the rate of atmosphere GHG accumulation/concentration] . . . but, the 'bath' is also drained by . . . the 'plug-hole' [like the natural 'sinks for GHG' . 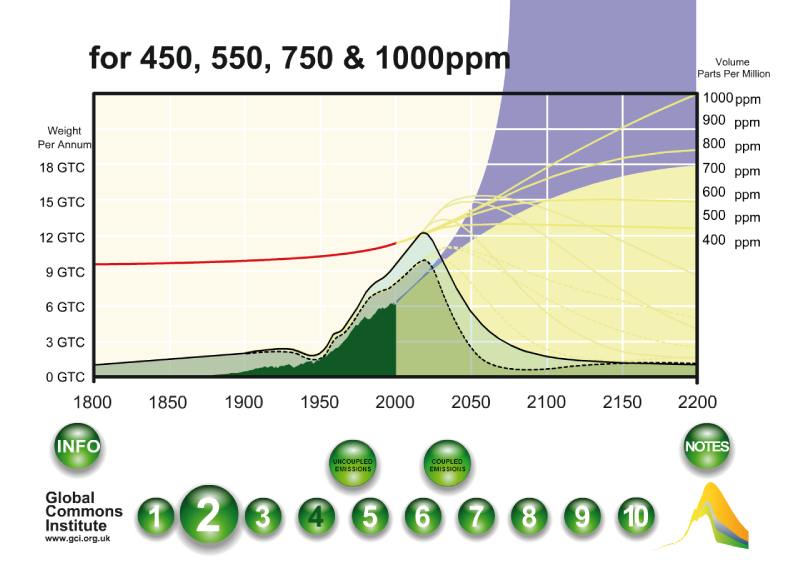 . . [affecting/slowing the rate of atmospheric GHG accumulation]. 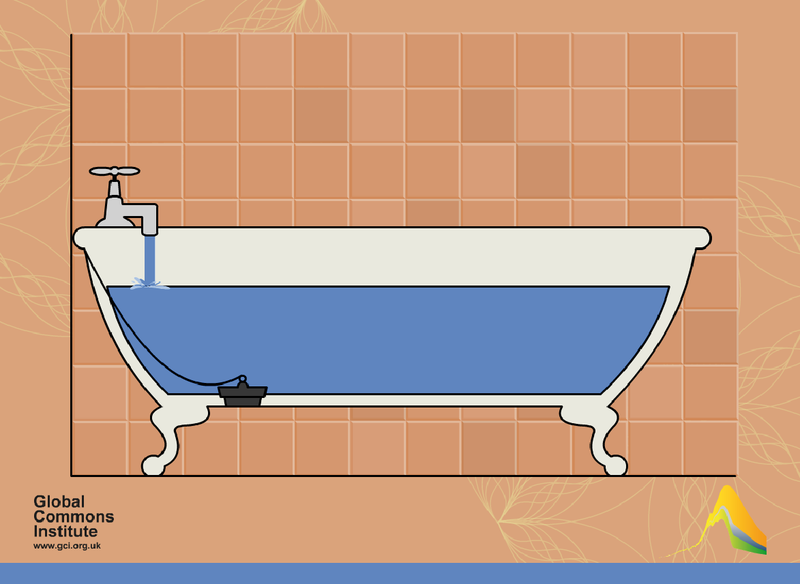 To stop the bath over-flowing, the tap must turned off in the knowledge that the bath level will continue to rise while the tap is being turned off. 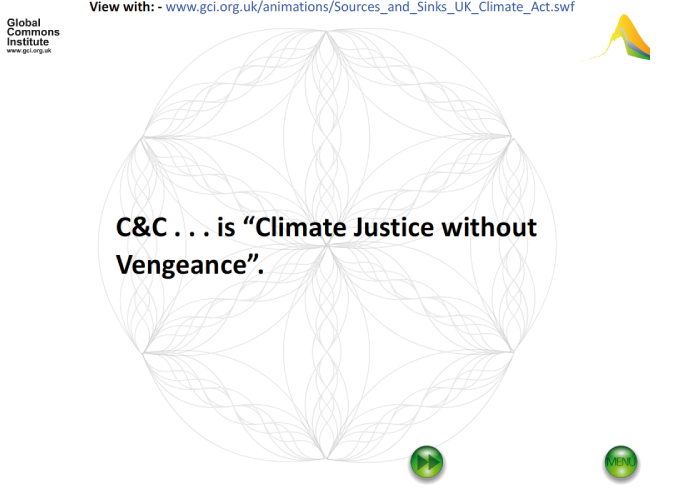 This is true for emissions, once the need for UNFCCC-compliance in the form of safe and stable future GHG concentrations in the atmosphere is accepted. 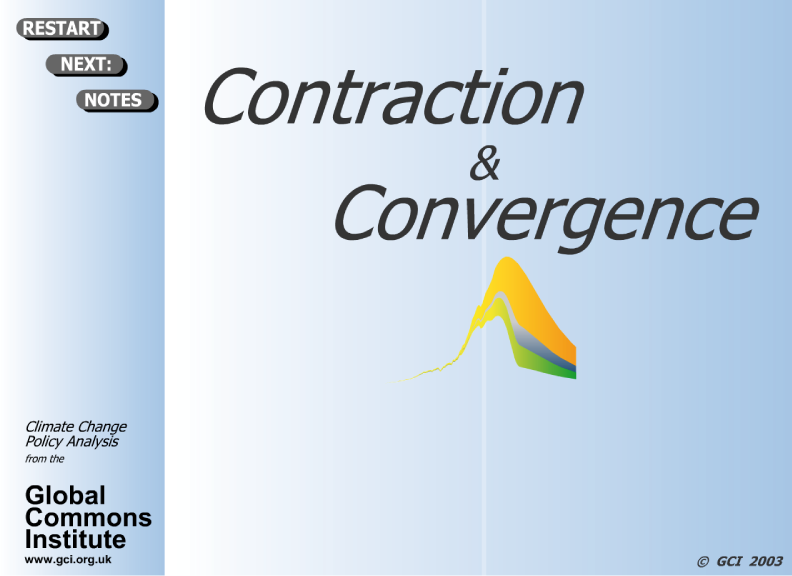 An assessment of 'Contraction & Concentrations' and 'Contraction & Convergence' and the C&C targets and modelling behind rates of 'sink-efficiency' in the UK Government's 'Climate Act' . 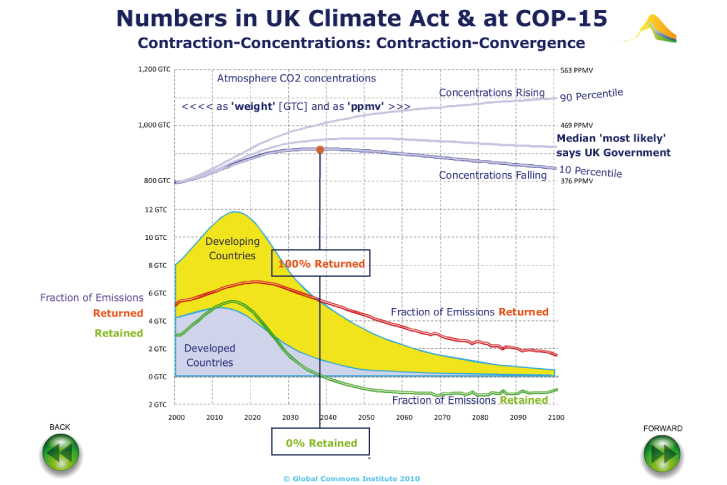 The '50:50' odds the UK Government gave for avoiding a temperature rise globally of more than two degrees with their emissions scenario are examined in this context. 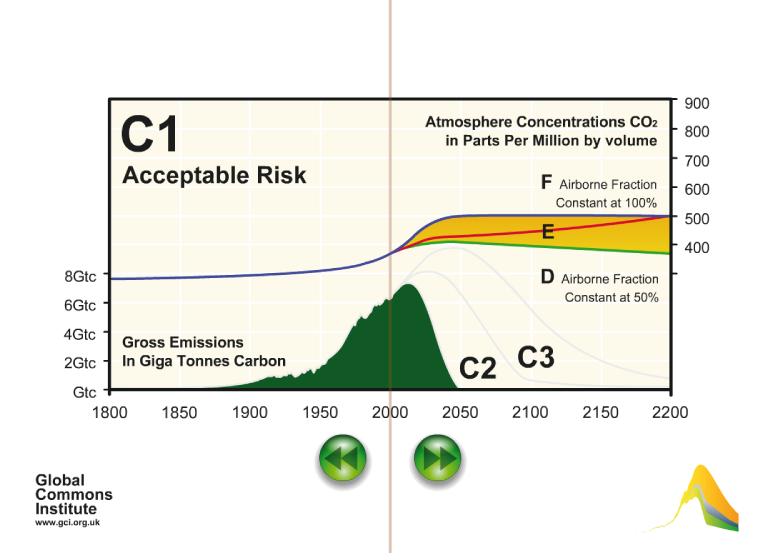 They are linked the Government's wholly unsubstantiated claim that atmosphere concentrations will fall after 2050 even though we are projected as only halfway through a 100-year emissions 'contraction-event'. 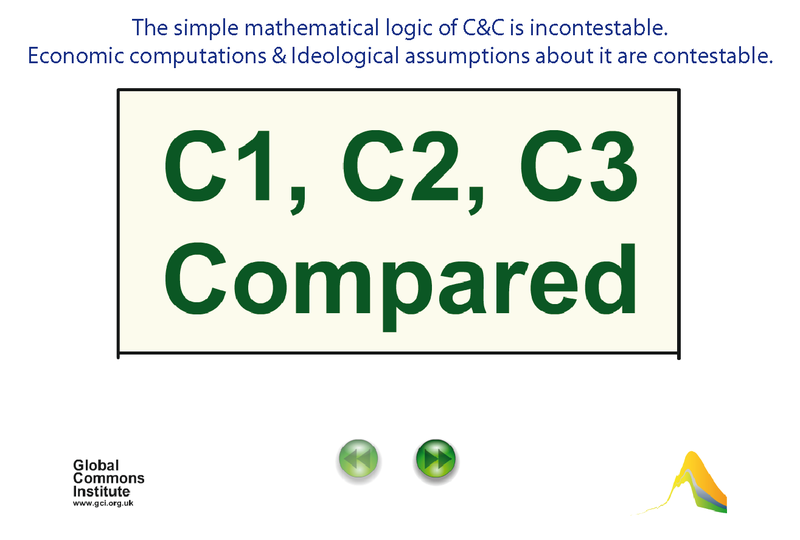 C&C in the context of COP-15 Copenhagen [12/2009] with a view on what went wrong and what it takes to get it right. Presentation/Animation - Also for 'download and save' as an swf file for internet browsers or a self-executing [virus-free] Flash file for PCs. Rates of C&C at four different theoretical rates of sink-failure. 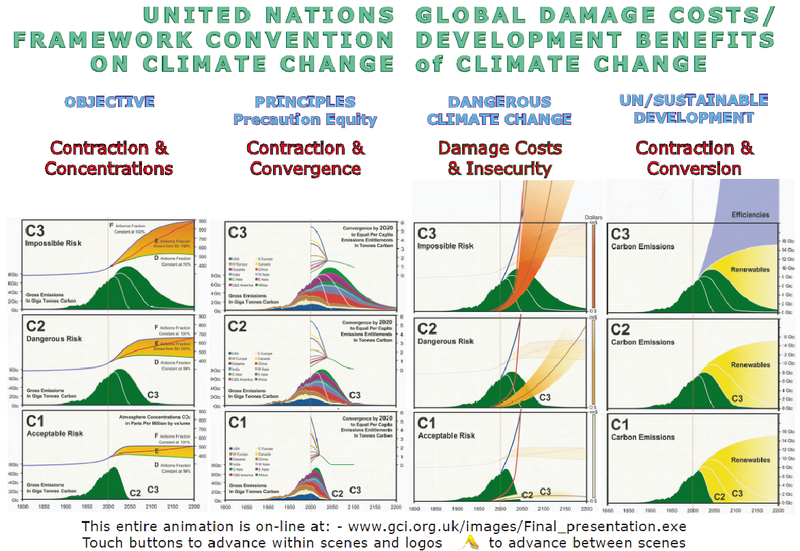 Presentation/Animation  that relates the arithmetic of emissions contraction to issues of: - convergence, climate- science, geo-technology, oil and gas depletion, growth and damages, clean energy and implementation.